RS-3200S Server solutions with Serial Attached SCSI controller supporting RAID 0, 1, 5, 6, 10, 50, JBOD and the Adaptec Advanced Data Protection Suite with RAID 1E, 5EE, 6, 60, Copy back Hot Spare and optional Snapshot Backup for pedestal, and high-density applications. RS-3200 SAS series RAID storage is Ideal for supporting server and workgroup applications where high levels of sustained read and write operations are required, such as video streaming, web content, video-on-demand, security and surveillance, fixed content, and reference data storage. Up to 3Gb/s per port. 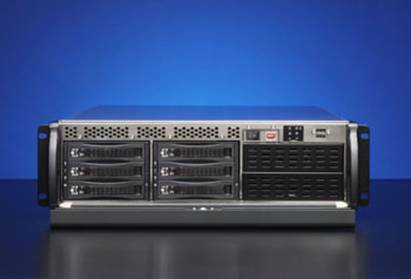 RS-3200 supports RAID 6 or 8 enhanced performance. RAID 6 is essentially an extension of RAID 5 which implements a second independent distributed parity scheme. RAID 6 can handle the failure of any two drives in the array while other single RAID levels can handle at most one fault. It provides the highest level ever of data protection without sacrifice the performance. The next generation Hard disk drive (3Gbps performance) with features such as native command queuing (NCQ). R-STOR series is a fully modularized design that replaces all the cables with connectors. RAID Controller, cooling fans, disk drive, and power supply can be easily swapped to minimize the down time of the RAID service. The user-friendly lock is designed with keyless and secure 2 steps safety measurement to prevent accidental removal of the hard drive. Striking the balance between thermal and acoustics, CePOINT’s smart redundant fan operates at a highly efficient cooling mechanism. The design of the 2 linear redundant fans in a module works more efficient to ventilate the heat out from the rear. Redundant by Dual 375W Power modules with PFC feature, Loading Sharing type and cable-less design. Redundant by Dual 460W Power modules with PFC feature, Loading Sharing type and cable-less design. Operating Temperature : 10 to 35 degree C.
Specifications and configurations are subject to change without notice. Please inquire for availability and other availably options.